A high specific heat capacity; so the heat squeezed into every kilogramme is maximised. A high density; the heavier the material, the more heat it can store by volume. Moderate thermal conductivity – so the rate heat flows in and out of the material is roughly in step with the daily heating and cooling cycle of the building. Heavyweight construction materials such as masonry and concrete have these characteristics. They combine a high storage capacity with moderate thermal conductivity. This means that heat moves between the material’s surface and its interior at a rate that roughly matches the building’s daily heating and cooling cycle. Some materials, like wood, have a high heat capacity, but their thermal conductivity is relatively low, limiting the rate at which heat can be absorbed during the day and released at night. Steel can a store a lot of heat, but conducts it too rapidly to be particularly useful, plus comparatively little is used in buildings. However, a modest amount of thermal mass may still be provided if concrete floors are used in steel frame construction, although these are usually limited to a depth of only 100mm and are usually covered by a false ceiling, limiting their ability to absorb and release heat. How is thermal mass measured? Part L of the Building Regulations and its associated compliance tools (SAP & SBEM) account for thermal mass using k-values (kJ/m2K), which provide an indication of the thermal capacity per square metre of floor or wall. Lightweight walls have a low k-value of around 10 kJ/m2K, whilst for heavyweight walls it can be up to 230 kJ/m2K. Some generic k-values for various types of construction are published in Table 1e of SAP 2009, whilst more comprehensive values for concrete and masonry constructions can be found in: Thermal Performance: Part L1A 2013. Alternatively, bespoke k-values and other thermal mass related information can be calculated using a free Thermal Properties Calculator produced by Arup in partnership with The Concrete Centre. Describing a material or construction as having high, medium or low thermal mass gives a useful indication of its ability to store heat, as does its k-values. But, in order to get a better idea of how effective it is likely to be in practice, there are a couple of other important factors that need to be considered. These are firstly the length of time available to get heat in and out of the material, which is typically assumed to be 24 hours, and secondly, the rate of heat flow at its surface i.e. through carpet, plasterboard, tiles etc. These factors are accounted for in admittance values, which provide a simple means of assessing the approximate in-use thermal mass performance of walls and floors, making it a more sophisticated metric than k-values etc. 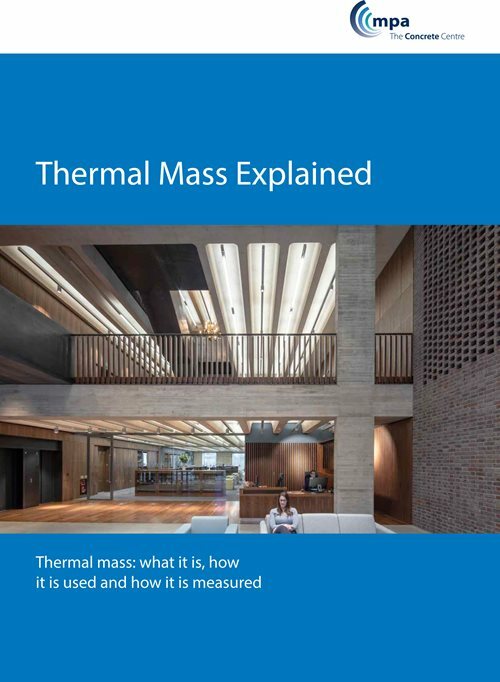 For more information on admittance values see: Thermal Mass Explained. Admittance values and k-values relate to the absorption of heat inside buildings, which is the most important use of thermal mass. There is however another thermal mass related property called decrement, which can influence summertime performance to a limited extent. Decrement describes the way in which the density, heat capacity and thermal conductivity of an external wall (for example), can slow the passage of heat from the sun as it passes from the outside to the inner surface of the wall (decrement delay), and also reduce those gains as they pass through it (decrement factor). For more information see: Thermal Mass Explained and for a comprehensive range of decrement values for concrete and masonry walls see: Thermal Performance: Part L1A 2013. Does thermal mass have any disadvantages? In summer, thermal mass is only beneficial if night-time ventilation (or some other means of cooling) can be used to remove the heat absorbed by the building fabric during the day. Local issues such as, noise, pollution and security concerns can sometimes make this impracticable, although there are design techniques that can be applied to overcome these problems. In winter, older heavyweight buildings with comparatively low levels of insulation and poor airtightness will require a longer pre-heat period to warm up the fabric, resulting in more fuel being used than in a similar lightweight building. However, for newer buildings the greatly improved standard of fabric performance means this is no longer the problem it once was, as the fabric retains most more of its warmth during periods when the heating is off. In practice, the ability of thermal mass to enhance summertime performance in many building types is of much greater significance. Nevertheless, in some types of intermittently occupied buildings, for example a weekend holiday cottage, thermally lightweight construction may still be the best option where heating is concerned, as it will enable a more rapid warm up period. For new mainstream housing, the preheat issue has become negligible in medium and heavyweight homes as we move towards ever higher standards of fabric energy efficiency. At the same time, the passive benefits of thermal mass are becoming more significant within the overall design, largely in response to the growing issue of overheating.